Our 100% reclaimed lobster rope mats are one of a kind creations made in Maine. Welcome guests, dress up your entryway and brighten your floors while reducing marine waste. A handwoven nautical mat made from time-worn rope. Great for indoors or outdoors on patios, decks, showers, boats, docks, campers, RVs, etc. We take varying lengths of 3/8" rope and bond them together into a single strand (reducing our scrap waste), then neatly weave them together to create a truly unique rug. Our mats and rugs are extremely durable and are well suitable for either indoor and outdoor use. They are easy to clean with a hose, power washer or dip in the ocean/lake. 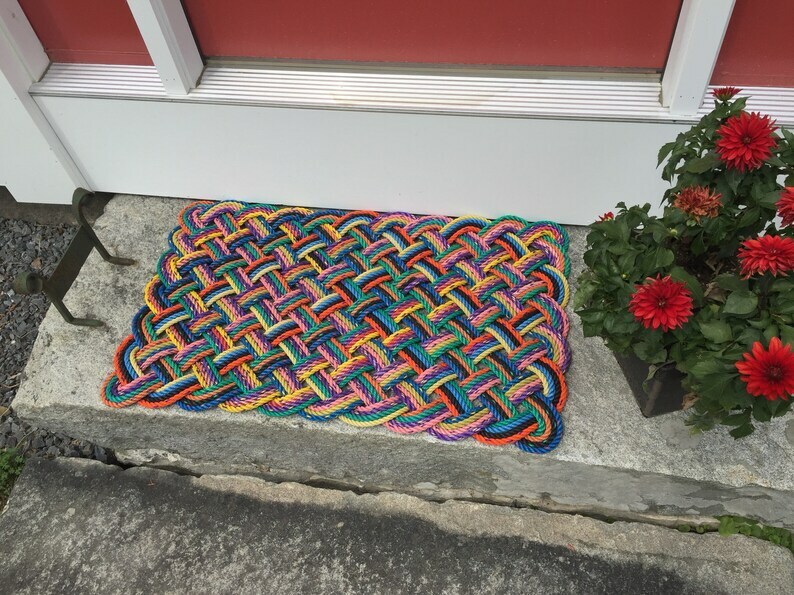 This made to order mat measures approximately 33" x 21" x 1.25"
The pattern is woven with 4 passes of varying colors of up-cycled lobstering rope. The pictures shown are style and color examples of the mat you would be purchasing. Check out our shop's other mat and rug designs and sizes. You will love these rugs. We have 5. Ships fast. Beautiful! Well made and colors are striking. Received it earlier than expected—well packed and no damage.